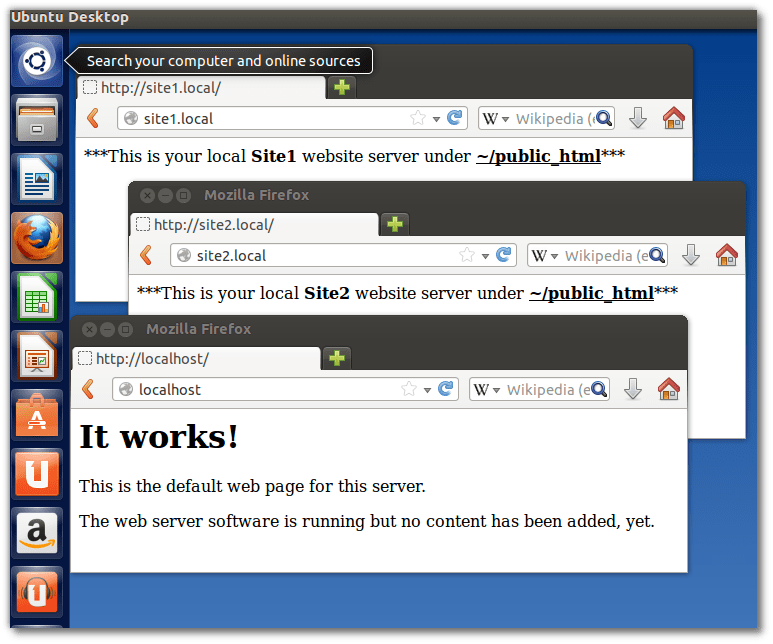 Next, create the public_html directory in your home directory and two site directories. This will prevent many “Access Denied” or Permissions errors when trying to access your local sites. Next we need to apply permissions to the public_html directory for the group www-data. Note: leaving “$USER” in the command will automatically use your current user account. Inside your ~/public_html directory, create a file called index.html and paste the following in it. By default the user directory module is not enabled in Ubuntu 13.04 and there are some lines that need to be commented out in the php.conf. 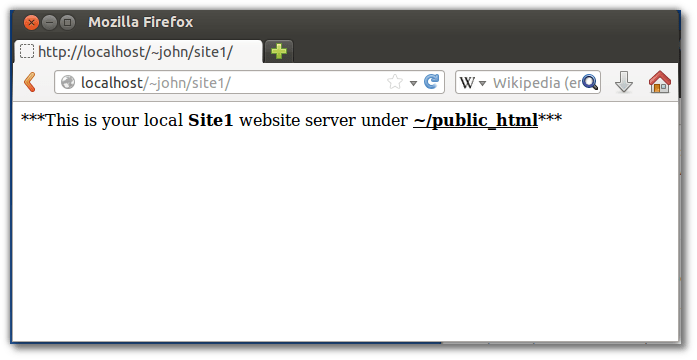 Next, you will actually enable your site1 directory to be served by Apache2! But first, a synopsis of what we are going to do. 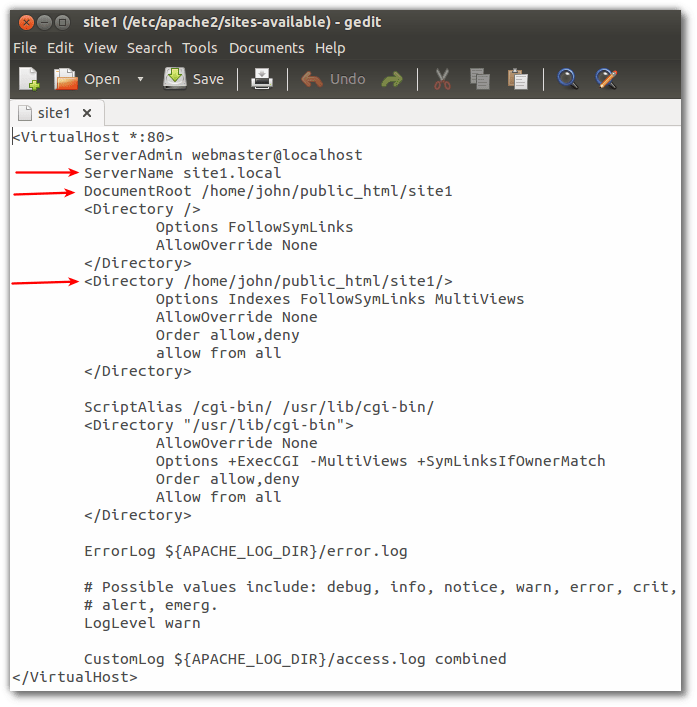 Apache2 configuration files are kept in /etc/apache2/ and in the Apache2 directory are two directories specific to this task, one is “sites-available” and the other is “sites-enabled”. Inside sites-available is a default configuration file, this file should not be modified unless you know what you are doing. The default file configures the site located in /var/www. But what we need to do is use it as a template. We will copy the file and rename it. Once we do that, then we have to enable the site so that Apache2 knows there is a new site to look for. 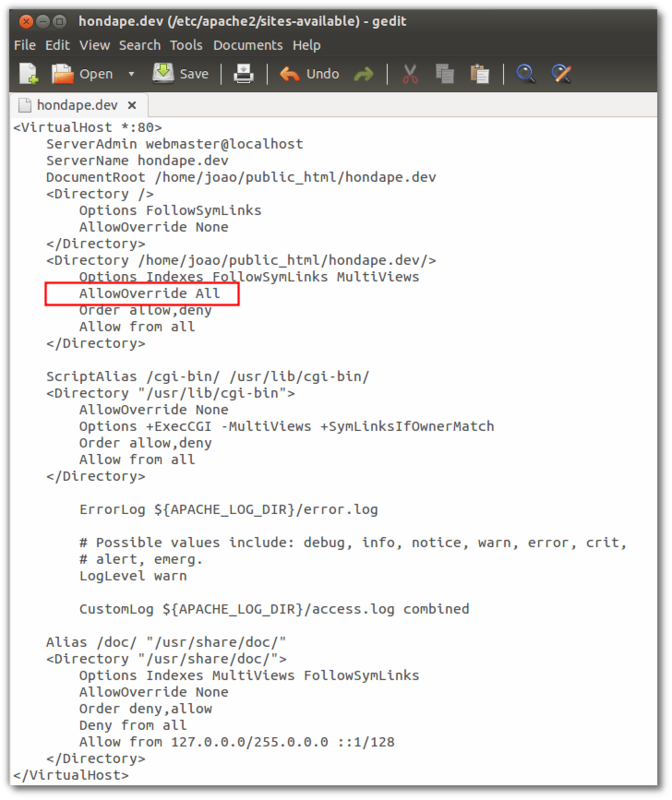 When we enable the sites, a symbolic link is added to the sites-enabled directory. Files in the sites-enabled directory should not be modified manually! Always restart Apache2 after making any modifications, otherwise they will not take effect until a reboot. Next, we need to edit the newly created file and configure it for “site1”. The ServerAdmin can be changed to your email, or one that is for that site or leave it as is. Here is the newly created file before and after! 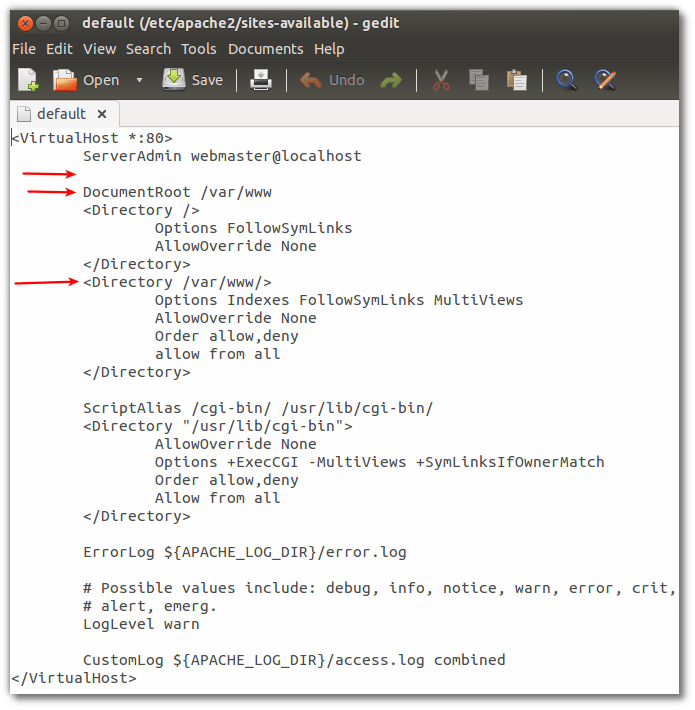 Next, edit the hosts file to reflect the new site1.local entry in the site config file. You should now be able to type “site1.local” into your browser and see the message we put in the index.html file in the directory site1. And of course the default localhost site under /var/www is still active. Now that the system is configured, adding site2 is a breeze! If anyone catches any typos, please let me know. Tagged: Apache, Apache2, drupal, drush, LAMP, local web, MAMP, Raring ringtail, sites, ubuntu, ubuntu 13.04, ubuntu web server, WAMP, web development, web server. You don’t have permission to access /finalfantasy1development.html on this server. sudo chmod a+x /home/user (replacing “user” with your user name? Do you know if you have the user group “www-data” and if group www-data has access to your public_html directory? Oh my, just noticed a typo on the path I put in my last post… sorry about that. If for some reason the folder is owned by Root, you can use this command to run nautilus as root but be careful, you will have full access to the system! I have updated the tutorial to reflect the comments through June 21st, 2013. Thanks to Jonathan for pointing out the permissions issue. You’ve been very helpful, I guess messing up is part of learning ubuntu. man took me almost a week to fix this. lol! thanks a bunch! You don’t have permission to access /dummies/ on this server. everything works fine, what might be the problem ?? I am assuming that “dummies” is a directory. Every directory has to have an index file, “index.html or index.php”, basically a default file that the server can look for when all the user has given is a directory. With “http://site1.local/dummies/link.html” you gave the server a specific file to look for with the just a directory the server looks for “index.html” by default, if it is not there it will give an error. i follow your instruction but i got this error…. Please how to solve it….. ????? that is not an error… it is a warning, because you are not registering the domain for the local sites. It’s normal output. when I see /var/www/ directory there is only one file with the name of “index.html.save”!!! Thanks heaps Jennifer! I upgraded to Ubuntu Saucy, and suddenly, some apache aliases stopped working because of this! Gut das wir Windows 7 haben !! Keine Probleme mit Apache !! I’d like to set up my system so it works like this, but so that I can also access one or several of the sites online, e.g. by entering the ip/dns adress to my system (or even by setting up a name server). Prefferably with an online/offline switch. Is this possible? Do you know of some other guide that describes this? 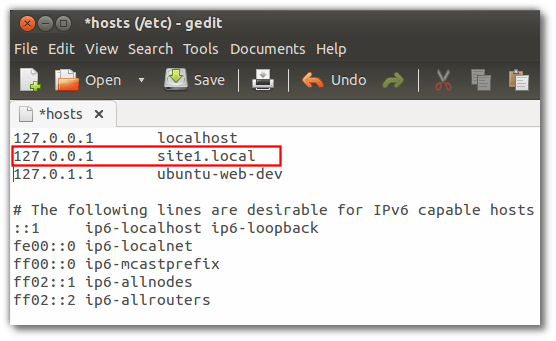 I’m quite new to linux..
Niklas, once you have the system configured as above and you want to access the local site remotely you have to configure your access from the internet. What I mean is, you would have to set your router (assuming you are using one) to direct incoming connections to your computer that you have the local site installed. For instance, if your local computer has an IP address of 192.168.1.16, then any computer on your home network can already access it by typing 192.168.1.16/~xxxx/yyyy (xxxx=your user name, yyyy name of your local site). Because your local site is already being served by Apache it is just a matter of accessing your computer from the internet, once you do that, then your system becomes available to whom ever is connecting. Thanks for this tutorial, it was absolutely crystal clear and worked perfectly for me. Many thanks! Thank you for the kind words Koen, happy to see so many people getting a use out of it. I get almost 100 hits per day from all over the world on that post alone. LAN local user can access my page but they cannot open the video link file which i had linked in my test.html file. what is the matter ? please help me. User cannot open access to watch the linked video file in html under ubuntu apache server. please help me. 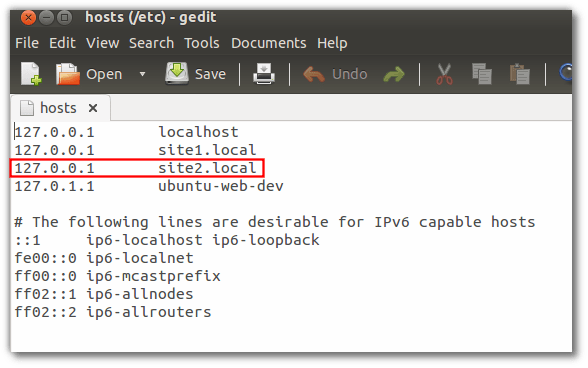 How i will allow the local lan user to access/open the video linked file under apache on ubuntu in test.html or any other extension .avi/mp4 etc . 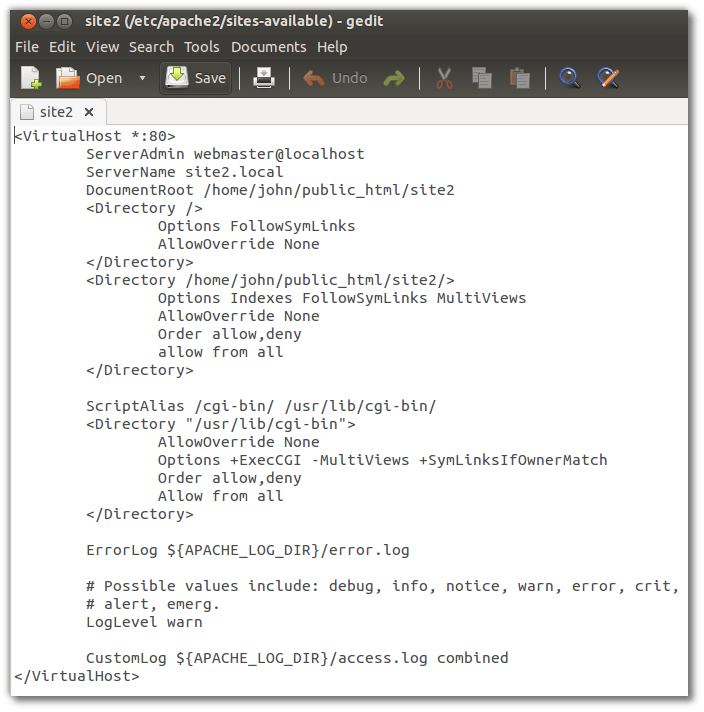 All files served by Apached must reside inside of your directory that you have the site installed in. If you are using your /var/www as your site, them all files must reside inside that directory. If you are using the /home//public_html for your site, then all of your files must be in that folder. In other words, what ever is your web document folder, all files that you will be accessing must reside in that folder. It is a permissions issue and it should be that way. I am running Ubuntu 14.04 and this doesn’t appear to be compatible with new Apache set-up where the main conf file has almost nothing and the conf is done in conf-available. I had to add a “public.conf” that defined the directory /home/*/public_html Thats what got things working on my box. Also as somebody already pointed-out this uses the old syntax and you need to follow the poster’s link to see the proper working of the directives. Hi John, as Jeniffer noted above with Ubuntu 13.10, Apache 2.4 was introduced and a different configuration along with it. This tutorial was created in July of 2013, before the release of Ubuntu 13.10. Can you update your tutorial to be compatible with Ubuntu 14.04 and beyond which uses apache2 ver. 2.4+?